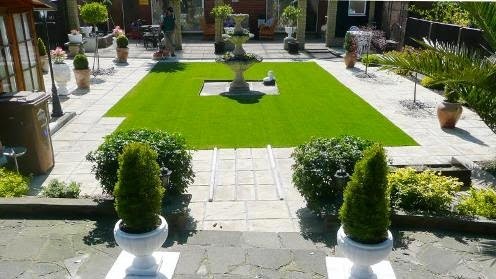 The image of artificial grass has, for most of its history, not been one associated with aesthetics. Rather the product,which was first commercialised by the Astroturf Company as a playing surface for sport in the 1960’s, has long been a byword for crude fakery; the sort of product one expects to see lining the windows of their local greengrocer. But times have changed and with major advances in the artificial grass manufacturing process, the plastic greens of the sports world have shed their old image and are now making serious inroads into our very own English gardens. With our sales up 40% year on year and many others in the industry reporting similar growth, fake grass for the domestic market has defied the recession and steadily grown in popularity, thanks in no small part to a complete PR overhaul of its once gimmicky reputation. The takeup in the domestic market has been driven largely by the product’s perennial appeal of low maintenance and durability. Of course key to artificial grass’s recent success is the product’s increased realism to both sight and touch. But could there be another element to this visual appeal? Could it be that realism isn’t the only aesthetic motivator here? As human’s we’re drawn to symmetry and perfection in art but also in nature. Artificial grass’s level of realism has clearly crossed a boundary of aesthetic acceptability but at the same time there is a curious sense of perfection that a real grass lawn could never hope to portray? I think artificial grass’s visual appeal is in large part to do with the image of unobtainability it projects; a sort of idealised but ultimately dreamlike vision of what we would all like our real grass lawns to look like all year round, come rain or shine. Perhaps this also then explains the continued hostility to it. To some people, fake grass is simply cheating. But if we can’t obtain perfectly manicured evergreen lawns naturally, then surely it’s human nature to innovate and imitate. Fake grass’s slow trudge into social acceptability has born fruits in the most unlikely of places. In 2010 the Chelsea Flower Show allowed Easigrass and landscape designer Tony Smith to enter a display featuring artificial grass. Two years later we returned to win a Gold Medal with Tony and ‘Green with…’ Despite undoubtedly causing a fair few noses to turn upwards in the process, the display won plaudits from judges and the public alike. 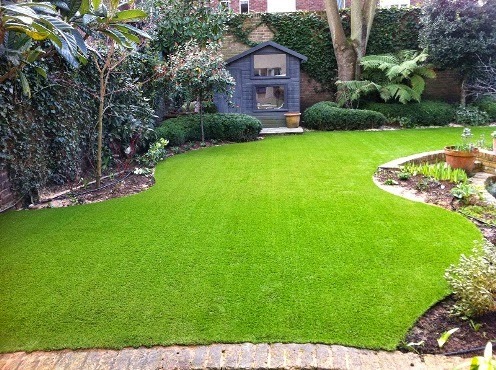 As far removed as the Chelsea Flower Show is from the common English garden, it does represent a cultural turning point for artificial grass (our sales undoubtedly rose as a direct result). The aesthetics of the artificial used in Tony’s 2012 display, which showed tulips, orchids and ferns in a cage lined with artificial grass, created a stark contrast but also at the same time stark symmetry. The flowers have all been seen as objects of desire and indeed envy at different periods in history. Perhaps the artificial grass of Tony’s display represented the future. Our gardens, like our homes, are projections of our tastes and our fashions and ourselves. For all the utilitarian advantages of artificial grass over the real thing, I wonder if there isn’t something deeper at play here. Could it be that alongside the natural life cycle of nature there’s something intrinsically human in our desire to evoke the enviable aesthetic perfection of an everlasting lawn. About the Author: Anthony Gallagher is Managing Director of Easigrass Group, a network of award-winning artificial grass franchisees and international licensed partners. Under his stewardship Easigrass became the first artificial grass company in the world to exhibit at the Chelsea Flower Show with designer Tony Smith in 2012 before going on to win a Gold Medal in 2012. You can follow Easigrass on Twitter, Facebook or visit their YouTube channel.